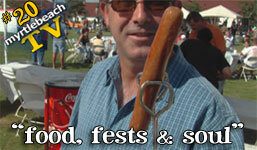 First airing on FOX Friday morning, October 12, 2007, episode 20, "Food, Fests, & Soul", covers five major events: The Surfside Beach Family Festival, The Greek Festival, The Shrimp and Jazz Festival, Fall Bike Week, and Band-Aid for Autism at Broadway at the Beach. After opening at Crab Catchers in Little River, we then take viewers to the Surfside Beach Family Festival on Surfside Drive in Surfside Beach, where Scott Perez introduces his family and talks with Elana Powers and other locals. There was so much going on during this fun festival, that we couldn't fit it all in the time alotted during the show, so we're going to have additional footage from the Surfside Beach Family Festival available on this site in the next couple of weeks. Next our audience were treated to dancers at the Greek Festival in the area surrounding St. John's on the Bypass in Myrtle Beach. We then headed back up to Little River for the 3rd Annual Shrimp and Jazz Festival along the historic Little River waterfront, where music, good food, and lots of families and friends filled the normally quiet streets. Following a Myrtle Beach Chamber Business After Hours at Family Kingdom Amusement Park, we jumped on the wooden rollercoaster and shot some striking hi-def footage from the second car. That coaster has more punch than it looks from the ground! Both our still and video cameras were temporarily disabled by the G-forces during the ride. 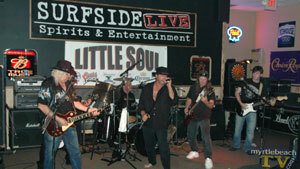 Pro-circuit southern rock band Little Soul was featured this week, playing live at Surfside Live in Surfside Beach. Look for more coverage of Little Soul by myrtle beach TV in the future, as we thoroughly enjoyed talking with each of these guys, and rocking to cover songs they played, as well as their infectious, original music. We then checked out Band-Aid for Autism, sponsored by CAMP and others, at Broadway at the Beach, where several great bands played, and Cathy Honeycutt spoke with several people involved with helping local autistic children. There was so much going on at this event, too, that we also didn't have time to air all of it. So we'll also be editing and uploading additional footage from Band-Aid for Autism on this site in the next couple of weeks. Viewers were then treated to a sneak peak inside the insanity of "Jerked! ", an upcoming segment on the show created by the horseyheads at Tequila Mockingbird in Garden City. During our political segment, Scott Perez and Surfside Councilman Bill McKown headed to the Myrtle Beach Airport where they talked again, in more depth, about Bill's role as Chairman of the Airport Advisory Committee for Horry County. Also on the show: Mary Martin talks with the new owner of The Brentwood Restaurant, Fall Bike Week Wrap-up on the north end, Jay's of Little River, and a sneak peak at Sunday Brunch at 3500 in the Prince Resort. The show closes with a behind the scenes segment that divulges more of the raw of the taping of the beginning of the show. 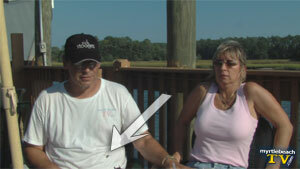 Let's just say, it becomes very obvious to viewers that Marcia has a bit of trouble with bees. Unfortunately, the broadcast version that aired on FOX TV had technical difficulties and during this segment the screen pixelated, then froze. Due to this technical glitch, the end of the behind the scenes segment and the credits did not air on television. So we provide the full ending of the show here, which you can watch by either clicking on the text link or on the picture above. Or watch episode 20, "Food, Fests, & Soul", in its entirely and in its original HD format, by clicking here, or on the screenshot at the top of this page.